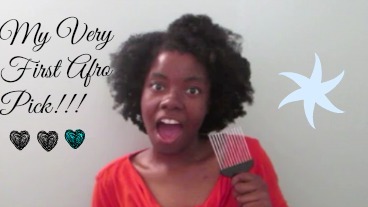 Beautybynajah.com: MY FIRST AFRO PICK REVIEW!!! MY FIRST AFRO PICK REVIEW!!! So I am finally getting around to doing this blog post and I am uber excited about it!!! The reason for this is because in over 5 years of being natural I have never -- and I mean NEVER EVER used a pick! Can you believe that?!? I mean the very thought of it astounds me! I am very happy with this pick because it is relatively seamless but the only problem is the very edges. Around the tips on the end there are sharp circular edges and I have to be real -- it can slice the hair if you're not careful. It is made of iron after all so in hindsight I would much rather buy a plastic pick. The only problem is it is near impossible to find a seamless plastic pick. Seriously -- they don't exist in stores and you have to scour the internet to find one. Something I am not prepared to do at this time because I simply do not have enough time. But trust me, when I get around to that I will update you guys on the brand I choose and what I really think about my choice. Seamless combs are extremely important to me as they incur less damage to the hair and promote my whole "healthy hair" agenda. SUPER CRAZY HAIR DAY RANT!! !